Featuring "Shadow Days" and "Born and Raised"
Columbia Records is pleased to announce the release of Born and Raised, the fifth full-length album from Grammy Award-winning singer, songwriter and musician John Mayer. Mayer produced the 12-song set with the much-in-demand Don Was, who's worked on albums for acts such as the Rolling Stones, B.B. King and Bonnie Raitt among others. Rock legends David Crosby and Graham Nash provide vocals on the album's title song. Additional musicians joining Mayer on the album and on the road include highly-regarded keyboardist/pianist Chuck Leavell, who has worked with the Rolling Stones, Eric Clapton and The Allman Brothers Band, as well as previous collaborators Sean Hurley on bass and Aaron Sterling on drums. Jim Keltner makes a special appearance on drums on "Something Like Olivia." 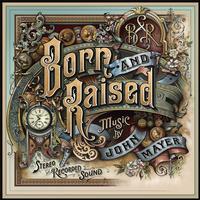 Born And Raised will be preceded by the country-tinged lead single "Shadow Days." Mayer's previous albums Room for Squares (2001), Heavier Things (2003), Continuum (2006) and Battle Studies (2009) have sold more than 12 million copies combined. He has been honored with seven Grammy Awards and an additional 11 nominations. He has also been included in Time Magazine's annual 'Time 100' list of the most influential contemporary thinkers, leaders, artists and entertainers, and twice been featured on the cover of Rolling Stone Magazine's annual Guitar Issue.